The legal fight against the shameful and motivated attempt of Doordarshan and the Government of India to project the usurper king of Mysore, Tipu Sultan, as a national hero, was a long, expensive and frustrating ordeal. According to authentic and documented history of the period, Tipu Sultan had hanged to death and sold as slaves a large number of innocent men, women, and children; looted and destroyed and burnt down hundreds of Hindu temples and Christian churches; and circumcised and converted to Muhammadanism thousands of Hindus and Christians in Mangalore, Coorg, Coimbatore, Dindigal, and Kerala. He had made territorial concessions to the French whose help he sought to fight the British. He had also sent emissaries to Islamic countries – Afghanistan, Iran, and Turky – inviting them to conquer the whole of North India for the glory and spread of Islam. But the Doordarshan serial on Tipu Sultan, based on a novel entitled The Sword of Tipu Sultan by Bhagwan Gidwani, was full of deliberate distortion, fabrication, and suppression of recorded facts of history with the object of glorifying a villain as a national hero, a benevolent ruler, and a paragon of all virtues. 2. The Petitioners objected to and protested against Doordarshan misusing the official media network to telecast a controversial serial full of lies, distortions and white-washed stories about a historical figure who was hated all over South India for his heinous crimes and cruelties in the service of Islam. This was bound to mislead the gullible general public into believing that a treacherous and cruel Islamic bigot was a renowned national hero – travesty of truth which is against the very spirit and purpose for which the Doordarshan was set up. It was for these reasons that the Petitioners requested the Bombay High Court (later the Supreme Court also) to restrain the Government of India and Doordarshan from telecasting the Tipu Serial based on the dubious novel of Bhagwan Gidwani. They asked the Court to direct the Doordarshan to project the character of Tipu Sultan based on his real life known from the recorded history of South India. Point . : The dominant character of Tipu Sultan as presented in the book of Gidwani “The Sword of Tipu Sultan”. 1. He claimed to be a Paigambar. 2. He adopted the title of Padshah. 3. He sometimes designated his own State as “Sircar-e-Khodadad -e- usud-ilhye -e- Ahmady” – in plain language, an Islamic State. 4. He introduced a new calendar beginning with the birth of Mohammed the Prophet, and the names of the months and years were in Arabic language and Hijra calendar. 5. He changed the Hindu names of cities, towns, villages, and fords to Muslim names in the State of Mysore. 6. 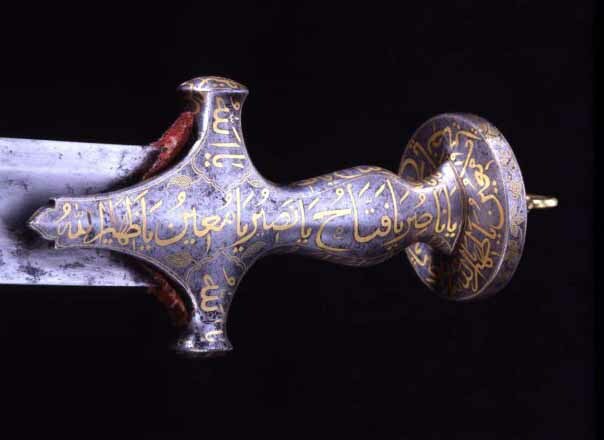 Inscriptions on Tipu’s sword, on stones, on coins, and on gold mohurs were in the name of Allah, or in the name of prophet Mohammed, or in praise of Islam, or for the destruction of unbelievers and infidels (Hindus). 7. He invented new names for his coins. His gold and silver coins were named after the saints of Islam. His copper coins bore the Arabic and Persian names of stars. The first double paisa of Tipu was named Afzal Khalifa. Some pagoda pieces were called Ahmadi, one of the names of the Prophet. 8. He introduced new weights and measures. 9. The list of chiefs of every province and district showed only Muslim names. All the strategic positions were held by Muslims, and not a single Hindu name is found. 10. He created two types of troops or corps – Ahmadis and Usud Illeye. The Hindu captives were converted as Usud Illye and the rest were said to be Ahmadis. 11. His commands were promulgated in the language of the Koran, particularly in keeping with passages from Chapter II, IX, and LXI. 13. He proclaimed that his commanders should serve Islam: “Promoting the prosperity and advantage of the people of Islam and the overthrowing of unrighteous infidels, you will do whatever may be in your power to increase the lustre of the firm religion of Mohammed. 15. He appealed to the Muslims abroad, specially the Asian Sultans, to help him in his mission. He wrote to Zaman Shah the ruler of Afghanistan, and to the Persian and Turkish rulers. He pleaded with them to invade North India and depose the infirm (Moghul) king who had reduced the faith to this state of weakness. 16. He wrote to Zaman Shah, the king of Afghanistan, that “we should come together in carrying on a holy war against the infidels, and for freeing the region of Hindustan from the contamination of the enemies of our religion (Hindus)”. 17. He sent delegations to Kabul, Basra, Istanbul, Mauritius, and Paris, and embassies to Persia, Turkey, and Constantinople, that is, to the Caliph of Islam. 18. He invited the French for help against the British in India for his own purpose. His plan was to divide South India between himself and the French. There were written agreements between the two parties in this respect. He requested the French to supply ten thousand trained Europeans and thirty thousand negros. 19. He demolished eight thousand Hindu temples and forcefully converted thousands of Hindus and Christians. All these clearly explain and establish the dominant character of Tipu Sultan as a fanatic and cruel Islamic ruler, as inviting foreign imperial powers to invade and subjugate the country, and also as committing every known method of cruelty to convert Hindus. He did all this for the glory and spread of Islam in India. He never had any patriotic sentiments nor high principles as depicted in the scandalous novel of Bhagwan Gidwani. The Hon’ble Supreme Court, after stating that all the places, personalities and events are historical, allowed the Doordarshan to telecast the distorted version of the life and deeds of Tipu Sultan as a non-historical fiction. This entry was posted in History, Nation, Threats and tagged Supreme Court on Tipu, The Sword of Tipu Sultan, Tipu Sultan on November 12, 2015 by arisebharat.